Home / chatty / tea towel curtains — now even easier! I made a quick little set of embellished kitchen curtains when we lived in LA a couple of years ago — two floral-print tea towels with buttons sewn to the center of each flower. It’s a fun, easy project, but today I came up with an even simpler version for the other set of windows in our kitchen… so the button-flowers can live over the sink while these new ones hang out at the end of the room, replacing a heavy beige home-dec fabric set that came with the house that really wasn’t us at all. It’s just a few pieces of fabric switched out, but it feels like a whole new room — light, bright and open. I’m so happy with them! 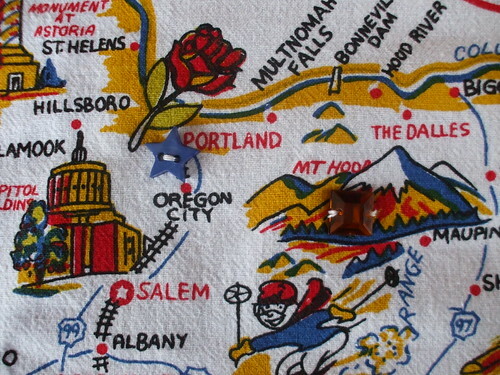 I picked the blue star for Portland and the amber-colored sparkle for my favorite place to visit, Mt. Hood (west slope). 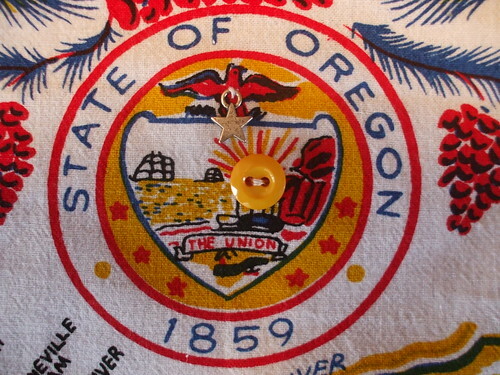 Then I added a few fun bits to the Oregon state seal at the top of the design, too. I did each of the four panels the same way and I want to add some more embellishments in other places I like when I have more time… but for now I just wanted the old ones gone and the new ones up, so a few twists of a screwdriver later, success! I’m a lover of maps, but any fun, vibrant pattern would do nicely. 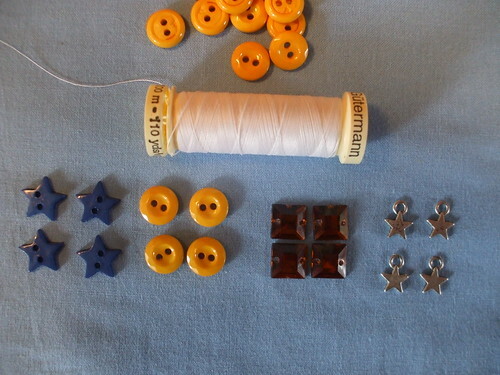 Add any types of embellishment you like — besides the buttons, sparkles and charms I picked, rick-rack, beads, lace, or ribbon stripes could be fun. Or just clip the towels up as-is and call it good! 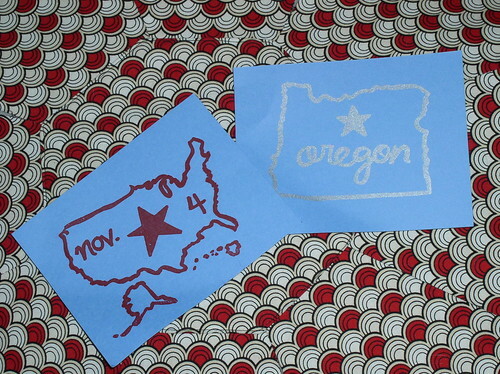 Speaking of maps, I gocco-printed two rounds of cards — silver Oregons and red USAs — for the Obama postcard party tomorrow, and Pearl permitting, I’m hoping to print two more in new colorways tonight. Thanks to Sarah of The Obama Craft Project for writing up the party today, and snapping this photo! If you’re in Portland and have time to swing by Tandem and write a few cards, that would be great! We’ll be there from 11-2. I’ll be the one with the dark-haired baby girl, the Gocco printer and the frequently refilled cup of coffee. Hope to see you! one-inch button pendant Monday already? These are SO cute. Love ’em. Those are great! I want some for my kitchen! The curtains are awesome! I love the little bits of embellishments and the sentimental stories behind them – so cool! I’m a map-lover, too, and any textile with a map on it just makes me darn giddy. those curtains are brilliant! 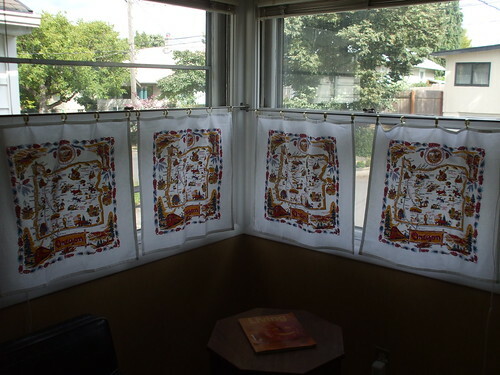 i am such a wimp about hanging drapes because i’m stressed about how hard they are to make (in fact, the only ones I have up in my whole house are the cute ones you got me from superbuzzy!). now i’ll be looking for cute tea towels with new confidence! and the postcards?! amazing! i wish i could be there for the party. aw, thanks ladies! I appreciate it! Nancy and Rachel, the same company makes California and Texas map tea towels if you are interested in taking a peek. I think the quality is really nice and I’d love one of each, to tell you the truth! They’re fantastic, Susan – and perfect for your kitchen! I love the little embellishments you added. Can’t wait to see them in person! I am glad that the website directed me to you. I am having a hard time finding curtains that are black with coffee cups on them. I was thinking I might have to make my own out of kitchen towels in order to get what I want and I think you are right. The towels do make the room personal and they are just what you were looking for in the first place. 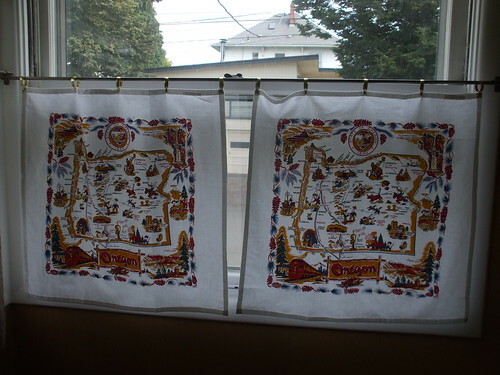 If anyone knows where I can get premaid curtains please feel free to let me know. I use tea towels or kitchen towels on my nightstands and end tables. My bedroom is light blue and cream so some daisy kitchen towels fit perfect and are easy to change and wash. My great room is Americana – once again red white and blue kitchen towels are used. No problem if spills occur and most were less than $1! We painted a wall in our Living Room “Pumpkin” from Benjamin Moore. It is a soft beautiful color but very hard to get curtains for. We have an Adirondack Style living room. I used 2 table clothes with stripes and hung length wise to cover my 120 inch window. I also bought 2 cloth shower curtains a in a dark pumpkin plaid for the winter. I hung them with the pine cone shower curtain hooks. It really added that country feel! Heya i’m for the first time here. I came across this board and I find It really helpful & it helped me out a lot. I hope to give something back and aid others such as you aided me. People are enjoying using advance mobiles and love to integrate custom mobile apps. are the most common foliage and rough colors, and sharpens the color of the ball against the now dull background, making it much easier to spot.